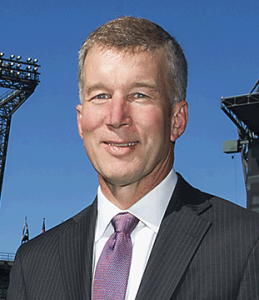 Kevin Mather, the Mariners' vice president of finance and ballpark administration for the past 18 years, was named the club's new president and chief operating officer on Friday, January 24, 2014. Mather began his new job on February 1 and reports to Mariners chief executive officer Howard Lincoln. A native of Madison, Wisconsin, Mather is a 1984 graduate of the University of Wisconsin, where he received a degree in accounting and risk/insurance prior to taking a job with an accounting firm for four years. He was hired by the Mariners as VP of Finance and Administration in July 1996, then promoted to an Executive Vice President's position in December 1999. Kevin Mather, President of the Seattle Mariners, tells about the current fight for the Wild Card spot and current strategies to put the Mariners in a fantastic place in the future. Club news includes information on August Membership Month, our Exchange Student from Spain, the BBRC Golf Tournament, Rotary First Harvest and updates on the DACDB website along with some fun with our Sergeant-At-Arms. Bob Holert introduced our guest speaker, Kevin Mather. Kevin Mather joined the Seattle Mariners 19 years ago. This was the start of an era that began with “Refuse to Lose” and growing the fan base to two million fans today. Kevin Mather and his family (wife, Shannon, and two “now Husky” boys) moved to Seattle in 1996 and joined the Seattle Mariner organization as the EVP of finance. He was in charge of overseeing the building of Safeco Field. Kevin also was instrumental in changing the Revenue Sharing pool system that protects small market teams around the American and National Leagues. In January 2014, he was selected to succeed Chuck Armstrong as team president. Mather spoke about the Mariners current fight for the Wild Card spot and the strategies in place for success with the plans for Felix Hernandez and remaining games in the season. Payroll has grown from $91MM to now $108MM. Kevin Mather’s focus is on slowing down on waiver claims while building this very talented and young team. Along with a strong farm team and drawing from the Academy, the Mariners organization is in a fantastic spot going forward. After Wendi Fischer welcomed the group to the Bellevue Breakfast Rotary Club, Sheldon Sweeney gave the Invocation and pledge followed by Paul Chapman introducing visiting Rotarians and Guests. Wendi had all Rotarians with an “orange sparkle flower” on their badge to stand, announcing a new addition to badges for those with perfect attendance for the past rolling 12 months! Congratulations! Remember that membership required attendance is 60%, or 30 meetings annually. Make ups must be entered into the DACDB system for credit. Steve Lingenbrink, a past BBRC President and former District Governor, announced a District Membership Meeting on Saturday, August 23rd, from 9:00 to 1:00 at the Renton Senior Activity Center located at 211 Burnett Avenue N. in Renton, WA. Sharing of best practices and recruitment ideas to improve and retain membership. Hope you can join us then! Colleen Turner announced that our new exchange student, Ariadna Paraira, will be arriving from Spain on Tuesday, August 19th. Ariadna will be attending Sammamish High School in the upcoming school year. Colleen would like to organize a group of fun-loving Rotarians to greet her at the airport and welcome her to Seattle. Please let Colleen know if you would like to go and if you’re interested in carpooling. John Schwager reminded the group that there are only 31 days to go until our Golf Tournament and golfer numbers are far short of goal with only 30 signed up and a goal of 120. Please sign up today! John recognized each of the BBRC Golf Tournament sponsors and noted that we are still short by 5 sponsors and $5,000 from our goal. It’s still not too late to recognize your company as a supporter of the BBRC! Also, Kit Bowerman continues to seek additional auction items. We’ve collected some great Hole-In-One prizes along with some terrific silent auction items so this is an event you won’t want to miss!! Tim Leahy announced that the BBRC had a Croquet team at the recent Bellevue Sunrise Rotary Croquet Tournament on August 6th. Our team fell a bit shy of 1st Place so he went on a recruitment mission for next year. Eight lucky Rotarians were chosen from the audience to audition for a spot on the team. Michel Carter reminded the group that Rotary First Harvest is Saturday (8/9) from 9 to 1 at Northwest Harvest. Please sign up on-line. Wendi reminded everyone to update your profile on the DACDB system to make sure you are included on Rotary updates and birthdays!